I am so grateful for the ways God brings encouragement to us. This morning I woke up not ready to start the day let alone start a new week. Nathan was on call Saturday and while we expect Saturday calls to be long, this last call was one of the hardest since being here. Add that in the middle of an extended q3 call schedule and both of us are feeling worn down. Nathan called mid-morning to say he had someone that wanted to come down and visit. It was Baby M and her mother. Baby M was born with Down syndrome and a heart condition. They weren’t sure she would survive, but she’s now about 18 months old and doing well. She lives in the Jimi Valley, which is a remote area about 3-4 hours (depending on road conditions and availability of transportation) from Kudjip and has a small health station as it’s only medical care available. Nathan has been seeing Baby M regularly as he keeps track of her heart condition. A couple months ago he brought her mother to meet our little two with Down syndrome and has been able to talk with her not only as a doctor, but also as a parent of a child with Down syndrome. We were blessed to have a doctor in the States who had a son with Down syndrome. It was a huge encouragement to have a doctor that could relate on a personal level to both the blessings and challenges of living life with disability. Baby M’s mother wanted to come down to visit me and the kids today. She had a bag full of produce for us and she had made both Nathan and me bilums (woven bags) to say thank you for all the work Nathan is doing. When I first held Baby M she started crying, but she soon settled into my arms and I got to snuggle with her as I talked with her mama. As they left, Baby M, waved and gave us a big beautiful smile to help bring a little sunshine to a hard Monday morning. Please be praying for Baby M and her family as they raise her here with so few resources. Pray for wisdom for Nathan as he treats her heart condition and for us to continue to encourage her mother as she has encouraged us. And pray for strength during this time that is extra busy. Our little ones were too busy watching the baby to look at the camera! Jim and Kathy Radcliffe have been serving in Kudjip for nearly 33 years. They’ve raised their six children here and have touched countless lives both in Papua New Guinea and the United States. When I travel into town and someone hears that I am from Kudjip they often share a story of how Dr. Jim saved their life or the life of a loved one. Kathy has been involved in ministry in countless ways around the hospital. Her calm spirit is a blessing to patients, staff and missionaries alike. Many people have decided to follow Jesus through their ministry. Their time at Kudjip is quickly coming to a close as they prepare to move back to the United States just before Christmas. There have been many goodbyes and last weekend was a chance for the missionary family to say goodbye. While I am disappointed to have to say goodbye so quickly in our time here, I know God will continue to use them as they return Stateside. Would you pray for them as they leave a place that has been home for 33 years. 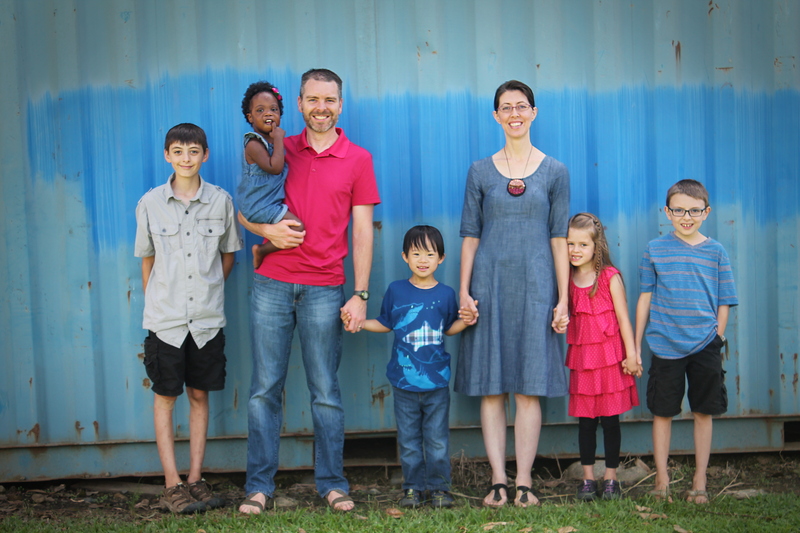 Pray for their transition back into life in America and for their ministry there. In this game we were given quotes and had to guess if Kathy or Jim said them. Over the summer our friend, Pastor A, asked us if we would visit his church and have Nathan preach. In September, Nathan had a free weekend, so he prepared a sermon in English and began translating it into Tok Pisin. The local tribal languages can be complex, but as a trade language, Tok Pisin is a fairly simple language that uses a lot of description rather than specific words. For example, a toe is pinga bilong lek (finger belong leg). With all the descriptions needed in translating, Nathan realized that even though his sermon was a reasonably length in English, it was going to be incredibly long in Pisin. He shortened it down in time for Sunday morning and we hopped in the Land Cruiser to drive the 15 minutes to pick up Pastor A along the side of the road. He directed us up a dirt road just off the main road and we tried to make it up the hill. It had rained some the night before and we didn’t make it up the muddy road the first time, so we rolled back down, put the vehicle in four wheel drive and made it up the second time without a problem. Most off the congregation was waiting at the church when we arrived and greeted us as we climbed out of the Land Cruiser. Pastor A’s wife was there with their four children. We had met his wife and oldest son before when they came for lunch, but were able to meet their other son as well as the their two little girls they adopted. About a year ago they built the foundation, frame and roof of the church building and for now the open walls let in a nice breeze during the service. Everyone entered and took off their shoes and our family was ushered to the front of the church. Pastor A introduced our family and then led the singing and three people accompanied with guitars. After knowing his story of once being a rascal who was always looking for trouble, I loved sitting there watching him lead singing and seeing his passion as he encouraged his congregation. His life has seen an amazing transformation through his relationship with Christ and it is evident in all he does. At one point during the singing I noticed more eyes on us than usual and turned to look behind me. Our youngest son was perched on the concrete foundation with his eyes closed and head swaying and he sang along with the congregation. The lack of walls proved to be a little distracting to my bug catchers as they saw crickets and beetles crawling through the grass. They were itching to jump to the other side to catch the little critters. They stayed through most of the service, but hopped out to join the other kids towards the end. After the service we chatted with many of the people and then they presented us with fruits and vegetables to take home. We are so humbled by the generosity of the people when we visit a bush church. And it is a blessing to be able to worship along side fellow believers. Do you participate in GivingTuesday? Or looking at end of the year giving? If you’d like to help bring physical and spiritual healing to the people of PNG follow this link to partner with our family at Kudjip Nazarene Hospital. Thanksgiving greetings from Papua New Guinea! We hope each one of you has a special time with friends and family this year. In the land of perpetual summer I completely forgot to pick up all the fixings for Thanksgiving dinner on my last trip to town. The kids assured me, though, that pizza would make a wonderful Thanksgiving dinner. So we enjoyed a lovely pizza dinner together with crystal light sent by friends from home and Nathan’s homemade french fried onions. We are thankful for each of you. The support we have felt in preparing to move here and, now, in being in Kudjip has been amazing. So many of you let us know that you are praying for the ministry, have sent us packages from home, have made it financially possible for us to be here, and have checked in to see how the adjustment to life in PNG is going. You are helping to bring physical and spiritual healing to the people of PNG and we are deeply grateful for each of you.